Based on real-time data from actual patients, Strainprint’s sophisticated analytics platform gives producers, clinics and researchers the information they need to make informed decisions about what to grow, what to prescribe and what trends are on the horizon. Think of Strainprint as your own cannabis market research department. Strainprint’s data comes from real people using cannabis and tracking their medical outcomes against treatment for more than 300 conditions and their associated symptoms. You’re getting medical records - not cannabis reviews. A robust data platform only becomes a valuable research tool if it's intuitive and optimized to address the challenges you face. 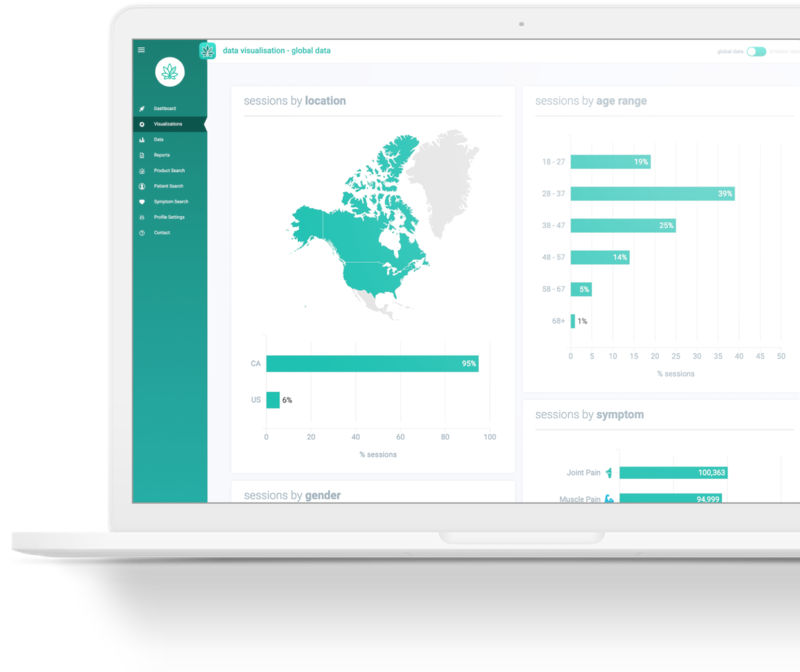 Our user-friendly dashboard makes it easy for anyone in your organization to perform in-depth cannabis data analysis to solve your real challenges. Pre-configured with thousands of lab-verified cannabis products, including ALL medical and adult-use products in Canada and a variety of U.S. States (where available). Extract, structure and present raw data in easy-to-read charts and graphics. Discover hidden trends, patient behavior changes, and top-ranked strains based on user interaction and efficacy. Strainprint is HIPAA/PHIPA/PIPEDA compliant - which is a lot of letters that mean we adhere to strict health information privacy laws and that all patient information is collected anonymously via a secure and robust web-based analytics platform. The Strainprint Loyalty Program keeps cannabis users engaged and encourages repeat tracking - which means ongoing data points for Analytics customers. Get secure access to the most comprehensive cannabis user data available today. Book a demo now. The anonymous patient data that Strainprint Analytics gathers and analyses is made available to cannabis industry stakeholders via a tiered subscription. Here’s how you can benefit. Suite 506 - 55 Town Centre Ct.
2019 © Strainprint Technologies Ltd.